Purpose: To create a fighter with unprecedented speed. Design Bureau: Aleksandr Sergeyevich Moskalyov, initially in Leningrad and later at the VGU and Aircraft Factory No 18, Voronezh. ov intended to use two Hispano-Suiza 12 Ybrs engines, each of 860hp (these were later made in the USSR under licence as the M-100), driving separate contra-rotating pro­pellers. The stillborn rocket version would have had a prone pilot, but the piston-en­gined SAM-4 featured a conventional en­closed cockpit; the designer did not explain why this was offset to port. This proposal was altogether too ‘far out’ for Mashkevich. No data survives. Purpose: To test an aeroplane with landing gears on the centreline. Design Bureau: S A Moskalyov at VGU and GAZNolS. 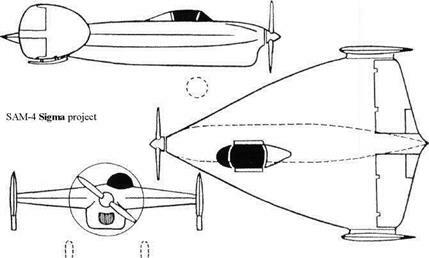 Unaware of the fact that Bartini had already flown the Stal’-6 (see page 16), Moskalyov de­cided in 1933 that it would be prudent to build a simple low-powered aeroplane to investi­gate the landing gear he proposed to use for his fighter, with a single mainwheel and skids under the wingtips and tail. It was flown in early 1934, but later in that year it was modi­fied into the SAM-65/s. The SAM-6 had a conventional tail, though its moment arm was very short and the air­craft was dominated by its relatively huge wing. The structure was wood, with fabric – covered control surfaces. The engine was a three-cylinder M-23 rated at 65hp. Behind the small fuel tank was the open cockpit. 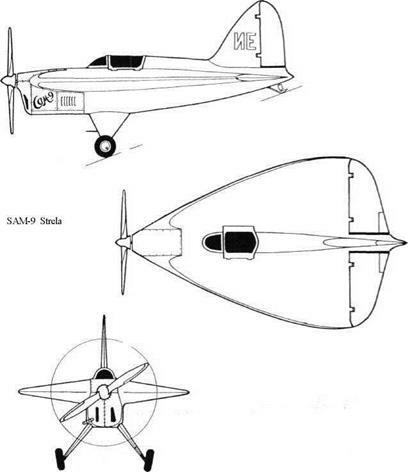 The Scheibe fins were not fitted with rudders, and were described by the designer as ‘plates’. Initial testing was done in early 1934 on centreline tandem skis. Later the front ski was replaced by a wheel on a sprung leg in­side a trouser fairing. After rebuilding as the SAM-66/s testing continued in 1935. This had tandem cockpits with hinged hoods, and in its final form a conventional landing gear was fitted with two trousered mainwheels. According to Shavrov ‘experiments showed that the centreline gear was quite practical’. Moskalyov intended to use such landing gear on the SAM-7, but ultimately decided not to (see original drawing of that aircraft). The fol­lowing specification refers to the SAM-6t»/s. 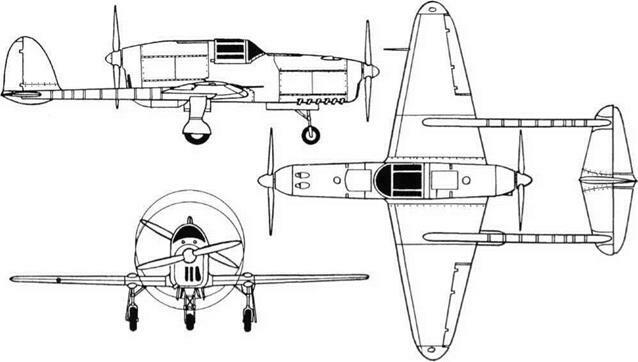 Purpose: To build a superior two-seat fighter. Design Bureau: A S Moskalyov, at GAZ No 18, Voronezh. In 1934 Moskalyov was engaged in engineer­ing later versions of TB-3 heavy bomber for production. This enabled him to use one of this bomber’s engines and propellers to power a fighter (though it was hardly ideal for the purpose). Despite the fact that it was far more complex than any of his previous air­craft, and also had advanced all-metal con­struction, the SAM-7 was completed in October 1935. Pilots considered it potentially dangerous, and factory testing was confined to taxying at progressively higher speeds, ulti­mately making short hops in a straight line. toring tailskid. 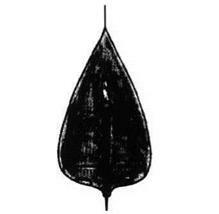 The structure was almost wholly Dl duralumin, the maximum wing skin thickness being 2.5mm. The nose inlet served the carburettors. 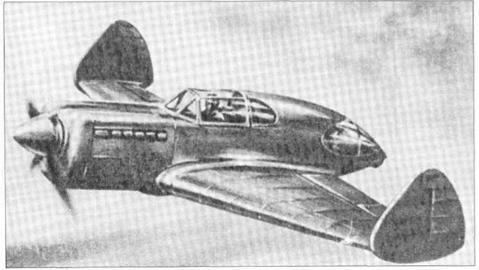 The 830hp M-34 en­gine drove a four-blade wooden propeller, and was cooled by a surface evaporative (steam) system similar to that of the Stal’-6. For use at low speeds a normal honeycomb radiator could be cranked down behind the cockpit. The intended armament was two ShKAS fixed above the engine, fired by the pilot, and a second pair mounted on a pivot and aimed by the rear gunner. One cannot help being astonished that Moskalyov was able to obtain funds to build this aircraft, because there is no mention of any official approval of the design (which would almost certainly have been refused). One feels sympathy with the test pilots, who were probably right to be hesitant. Original OKB drawing of SAM-7. Purpose: To test at modest speeds an aircraft with a ‘Gothic delta’ wing of very low aspect ratio. Design Bureau: A S Moskalyov, from 1936 head of his own OKB-31 at Voronezh. Always eager to build his incredible SAM-4 dart-like fighter, Moskalyov was rebuffed in these efforts until in 1936 US magazines fea­tured futuristic fighters with low-aspect-ratio wings, shaft drives and prone pilots. This spurred GUAP to invite Moskalyov at least to try out his radical ideas with a simple aircraft with an engine of modest power. 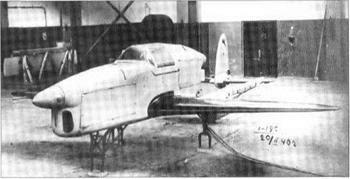 Following tunnel tests by V P Gorskiy at CAHI (TsAGI), the SAM-9 was built in 70 days, and flown on skis in early 1937 by N S Rybko at Voronezh. Following six flights by Rybko and A N Gusarov, it was taken to Moscow and tested in short hops by Rybko and A P Chernavskii, finally making eight full flights in the hands of Rybko. The aircraft was tricky, demanding an angle of attack of 22° at take-off and landing, and being unable to climb higher than 1,500m (4,921ft). Despite this the NKAP (state com­missariat for aviation industry) suggested that Moskalyov should produce a fighter with a 0.975 aspect ratio wing, and this led to the RM – l. SAM-29. The SAM-9 Strela (Arrow) was made of wood, with a brilliant surface finish, the cable-operated rudder and elevons having fabric covering. The thick aerofoil was of RAF.38 profile, with local modifications. The cockpit was placed between the two main spars, with a hinged canopy. The engine was a Renault MV-4 aircooled inverted 4-cylinder rated at 140hp. The neat main landing gears had pivoted rubber-sprung cantilever legs for skis or wheels, and the tailskid did not castor. The rudder and broad-chord elevons had trim tabs. but with difficulty. In a recent display ofmod – els of Moskalyov aircraft the SAM-9 was de­picted entirely doped red except for the propeller blades, and with a placard giving speed and altitude as 340km/h and 3,400m. Purpose: To design a small fighter with ‘push/pull’ propulsion. Design Bureau: A S Moskalyov, OKB -31 at Voronezh. spring 1941 it was undergoing LII testing in the hands of Mark L Gallai. Apart from the fact the nose gear never did retract fully, it was by this time promising, and it was entered for the summer high-speed race, but the German in­vasion on 22nd June stopped everything. The No 31 OKB was evacuated, but this aircraft had to be left behind so it was destroyed. The OKB documents have not been found. en, with polished doped ply skin. The main landing gears retracted inwards and the nose unit aft. One drawing shows the nose unit (which had a rubber shimmy damper) to have had a levered-suspension arm for the axle. The intended armament, never fitted, comprised four 7.62mm ShKAS, two above the front engine and two at the extremities of the wing centre section. 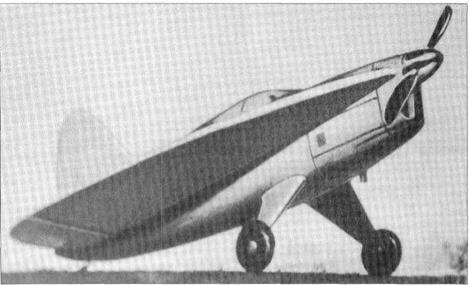 Moskalyov knew that the MV-6 was avail­able for licence-production in the USSR, and thought this aircraft might make good use of some. Even had the programme continued without interruption it is hard to envisage the SAM-13 being adopted by the WS. Purpose: To renew attempt to build a rocket-engined interceptor. Design bureau: A S Moskalyov, No 31.
fighter. This time most of the technology ex­isted, and S P Korolyov lent his support, but once the War was over such a project was judged to be futuristic and unnecessary. Moskalyov’s OKB was closed in January 1946, and he returned to lecturing, but he contin­ued to study this project for two further years. fuselage carrying a large fin and rudder. The Dushkin RD-2M-3V engine, rated at 2,000kg (4,409 Ib) thrust at sea level and much more at high altitude, was installed at the rear and fed with propellants from tanks filling most of the airframe. Two cannon would have been installed beside the retracted nose landing gear. This was yet another of this designer’s near misses, all of which stemmed from his abun­dance of enthusiasm. Two sketches, one called SAM-29, the other RM-1.